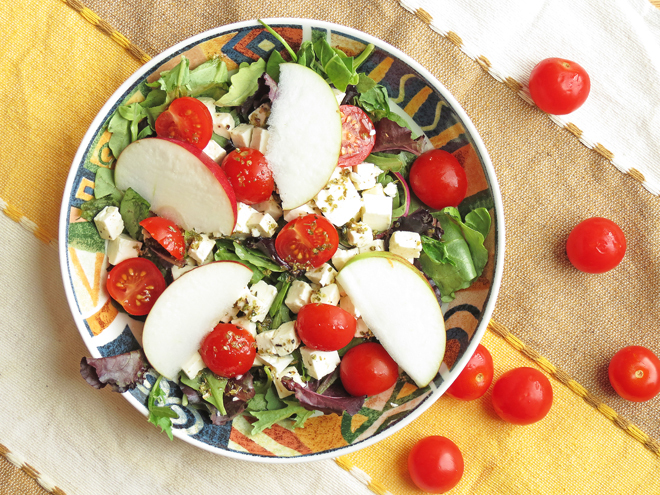 Today’s delicious easy feta apple salad is brought to us by our Contributor Ilona from Ilona’s Passion. Enjoy! Fall is almost here and for this season I made feta apple salad with home made lemony dressing. Recipes with pumpkin, pears, apples and sweet potatoes are everywhere at this time of the year. I have already made a couple of delicious recipes with pumpkin and apples. I love fall, I will spend more time in my kitchen baking and cooking. We still have warm weather and I like salad recipes but autumn is coming. I thought to use apples for this salad. I’ve never had any fruit in my salad. I thought that maybe it will taste strange. Oh! I was totally wrong. 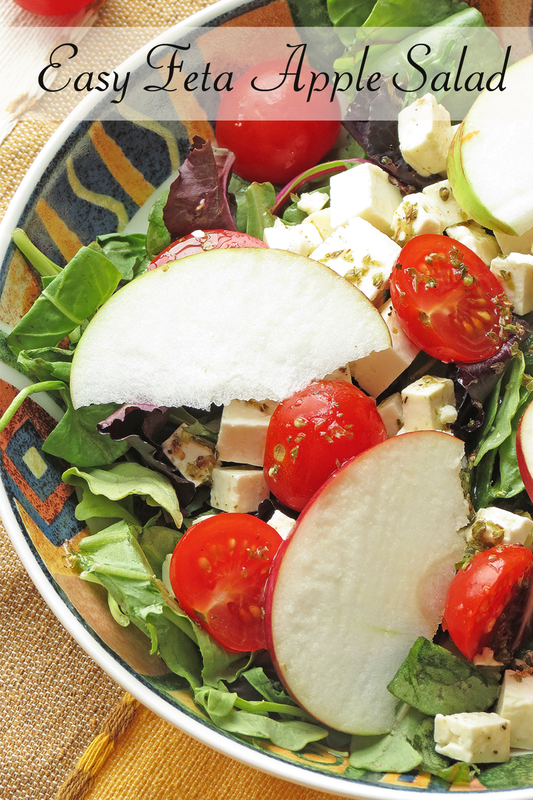 The combination of lettuce, feta and apples is great and very tasty. I hope you already tried my Cucumber Tomato Salad that I made couple weeks ago. And this time I’m giving you recipe for feta apple salad. I think the salad is perfect for summer and fall as well. 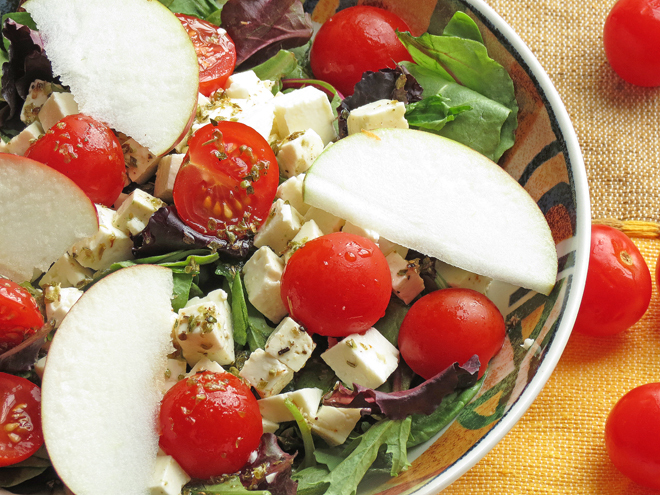 Lots of seasonal apples are in store right now and they can be perfectly used for this salad. It took me probably 10 minutes to make it including home-made dressing. Just prepare all ingredients and toss them together. The dressing is lemony with a hint of oregano. Combines very well with this feta apple salad. It is perfect for light lunch or as side dish for dinner. I had it just today for lunch and I know that I will be making more salads with apples. They taste great together. You can choose sweet or sour apple. Any apple will be perfect. 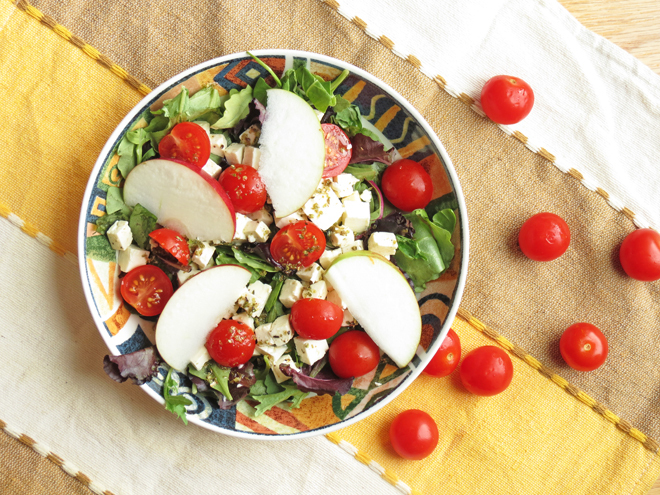 In a large bowl toss lettuce, tomatoes, feta cheese and apple. In a small glass container mix dressing ingredients: lemon juice, olive oil, oregano, salt and pepper. Are you excited for the pumpkin and apple season? What are you planning to bake or cook? Mmm! the combination of the sweet apple and the salty feta sounds scrumptious.